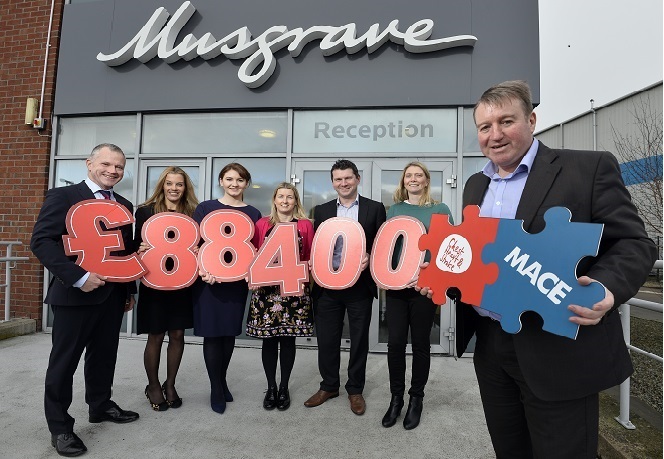 MACE has been raising funds for Northern Ireland Chest, Heart & Stroke since 2016 and to date has raised over £88,400. Since forging the partnership with leading local health charity NICHS a little over 18 months ago, MACE has played a significant part in helping to fund the charity’s Northern Ireland wide care and prevention programme. The money raised helps to support and improve the lives of over 5,500 local people currently living with chest, heart and stroke related conditions. It also helps to fund the delivery of a wide range of health promotion projects and initiatives in local schools and communities that are focused on preventing these illnesses in the first place. MACE, one of Northern Ireland’s largest networks of convenience stores, owned by Musgrave, has over 100 stores located in the heart of local communities across Northern Ireland. With the support of the NICHS fundraising team, MACE has organised a variety of creative community based fundraising events and initiatives, which have included coffee mornings and static cycles across their network of stores, a sponsored cycle from Killough to Italy and both corporate sponsorship of and staff participation in the annual NICHS flagship event, ‘the Wake-up PJ Walk’ at Stormont. Tom Kinnier continued: “I feel incredibly proud of our staff and customers who have been so dedicated and put a tremendous effort into raising funds for this important local health charity. Jackie Trainor, Fundraising Director at Northern Ireland Chest Heart and Stroke added, “This is a huge amount of money raised by MACE. Every week MACE manages to have another regional fundraising event planned and we really can’t thank their head office team, store managers and staff enough for their energy and support. This money will go a long way to providing vital support services to people with these life-limiting conditions. “By creating strong and effective partnerships with local businesses, NICHS can raise funds that will ensure that we are able to continue and expand our work to support everyone across Northern Ireland who could benefit from our services”, concluded Jackie.